Walking through the southern qarafa cemeteries along the base of the Muqattam hills on a Friday morning is a sport for residents of this part of the huge Cairo necropolis, for beggars and for those who are following in the footsteps of Sufi saints, awliyaa’. Several spiritual figures have chosen this secluded spot to build their zawiyas (recluse prayer areas) to meditate in isolation, far from the bustling city life. In their seclusion, they spent their time in dhikr, literally meaning remembrance of God. One such figure is al-Sayida Nafisa, the great granddaughter of the Prophet Muhammad (PBUH), who resided in Cairo from 809 CE until her death in 824 CE. Accounts tell of her voluntary seclusion in a retreat cell there where she meditated in khilwa, or utmost isolation from worldly preoccupations and a total concentration in the presence of God. With time, the southern qarafa came to be called the Valley of the Overpowered by the Love of God (wadi al-mustad’afin) in reference to it being an abode of the saints. The first Friday of the month of Muharram is a day that Sufi murids (students) and seekers never miss. It is the mawlid of al-Muharram, one of the established festivity traditions of the Wafa’iya Sufi order. This tradition was brought about in the 18th century to celebrate the new Islamic year by dhikr circles, prayers and almsgiving. The minaret of the mausoleum and mosque of the Sadat Wafai’iya has already been decorated with neon lights in the past days in anticipation of the festivity. On Friday, visitors from various places inside and outside Egypt came to attend the mawlid and pay tribute to the Wafa’iya saints who, for centuries, were the heads of a great Sufi order and constituted one of the elite social and spiritual families of the city of Cairo. The Wafa’iya is a Sufi order established by Muhammad Wafa (1302-1363) who was born in Alexandria. His family has its origin in Tunis and Sfax, and his ancestry goes back to Idris I (d. 791), the founder of the city of Fez and the first ruler of the Idrisid dynasty. Through this lineage, Muhammad Wafa is thus a descendant of the Prophet Muhammad (PBUH) from the side of Hassan ibn Ali. Muhammad Wafa was initiated into the Shadhili order by Dawud ibn Makhla (d. 1332), a student of the great Sufi scholar Ibn Ata’ Allah al-Sakandari (d. 1309), whose mausoleum is a short walk from the Sadat Wafa’iya mosque. Wafa lived for a while in Akhmim, in Upper Egypt, then moved to Cairo, where he built his zawiya. His fame spread slowly and he acquired the name Wafa when one day the Nile water dropped to an alarming level. Fearing famine, the people of Cairo asked him to pray God. He went to the river’s edge and recited a prayer after which the water rose to its regular level, making the people believe that he commanded the Nile to rise and that his command was fulfilled (wafa). After a long spiritual training, Muhammad Wafa established his own order. When he died in 1363, his younger son Ali, who came to be renowned for his poetry and treatises on mystical philosophy, followed him. Ali, as the khalifa of Wafa, was succeeded by 21 followers from his family until 1907 when the 22nd and last khalifa, Ahmad Abu al-Futuhat died leaving no male descendants. On the day of the mawlid, the square in front of the mausoleum and mosque turns into a busy area where iftar tables are spread and rows of chairs are showcased to welcome visitors and guests. Upon entering the mausoleum, one immediately notices the contrast between the noise of the outside and the serenity and tranquility of the inside. A strong smell of musk diffuses all across. Its source is the wooden chamber at the center containing the tombs of both Muhammad and Ali Wafa. Around this central chamber are 17 tombs of other members of the Wafa’iya. The number of tombs gives an air of solemnity to the place and one cannot help but be in awe. The entrance to the central mausoleum has a headstone marking the genealogy of Muhammad Wafa. Next to it is a marble column with carvings showing the spiritual motif of the Wafa’iya: My Lord, the Everlasting, the High, and the All-Wise. A small mosque is in front of the mausoleum and it has a beautifully decorated wooden mihrab. To its left, one sees an intriguing little door on top of which is written. 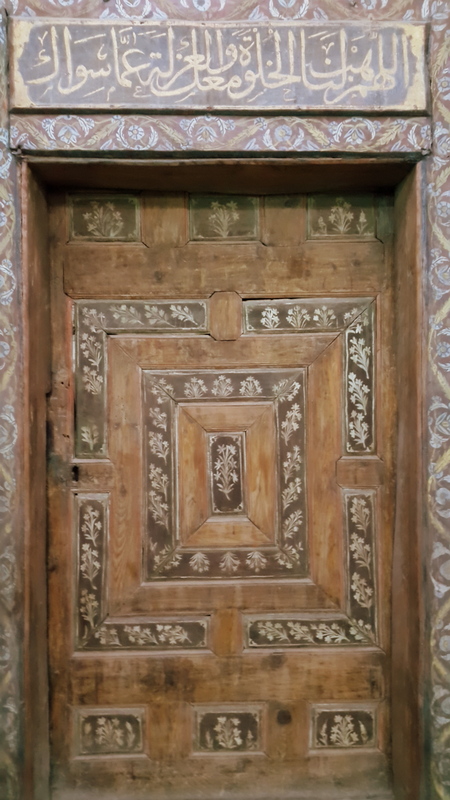 This door is a reminiscence of the earliest zawiya built by the Wafa’iya in this area, which later turned to be a family burial area. In 1777, Sultan Abdul Hamid I issued a firman to repair the zawiya and build the mosque, which until then was nonexistent. The mawlid proceeds in a peculiar way that is totally different from similar festivities by other Sufi orders. 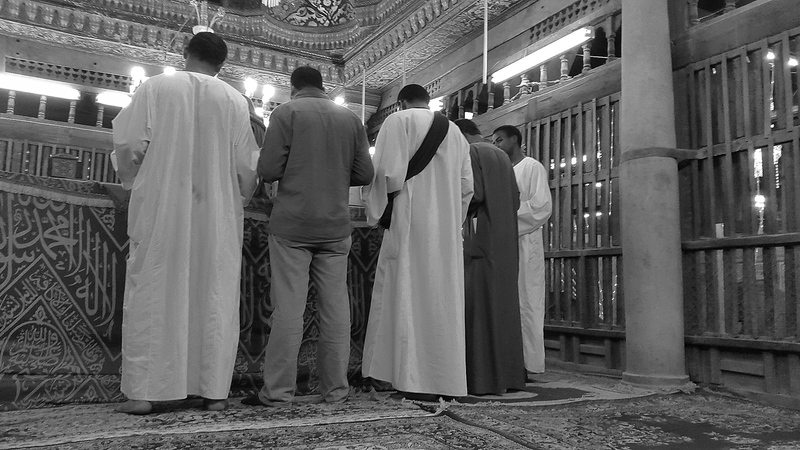 There are no signs of the market activities that usually accompany the religious festivities all over Egypt. There are no signs of tanoura dervish dancers or musicians. Perhaps it is because of the location in the heart of the qarafa cemeteries, or perhaps it is because of the nature of the Wafa’iya order that is known for its highly intellectual mysticism. Seekers who follow in their footsteps are scholars rather than dervishes. Throughout the day, people come to quietly pay tribute to the Wafa’iya tradition. 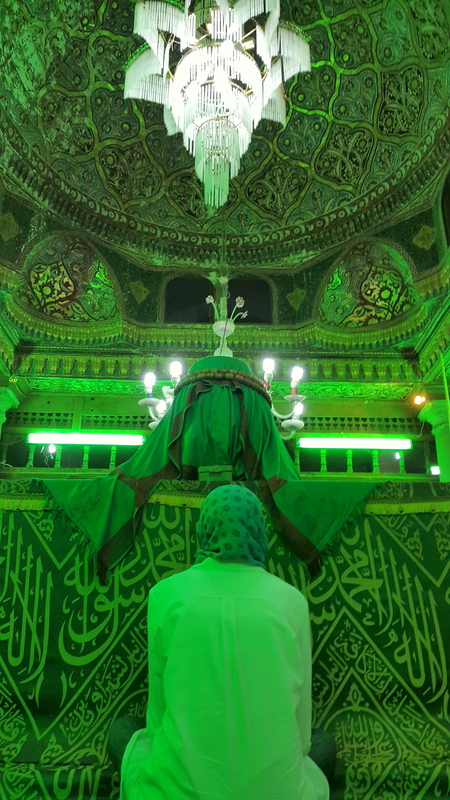 They recite al-Fatiha in awe and sit peacefully to enjoy the religious chanting in praise of the Prophet, or the poems of Ali Wafa sung by chanters who volunteer on the occasion of the mawlid. It is this verse that inspired the title sadat (literally meaning masters) that is usually added to the names of the Wafa’iya to credit them for their mystical, poetic and scholarly mastery.